Woman yells obscenities and tries to fight with a mother and her 2-year-old child at Sebastian Inn & Suites. SEBASTIAN – Saturday afternoons are usually quiet at the Sebastian Inn & Suites, unless there’s someone heavily intoxicated. Shara Lynn Whyard, 40, was banging on windows and yelling obscenities at people, according to the report. One of the windows was the hotel manager’s office. A witness told police that she was sitting on a bench with her child when Whyard approached them “yelling obscenities and wanting to fight her and her 2-year-old daughter,” the report said. 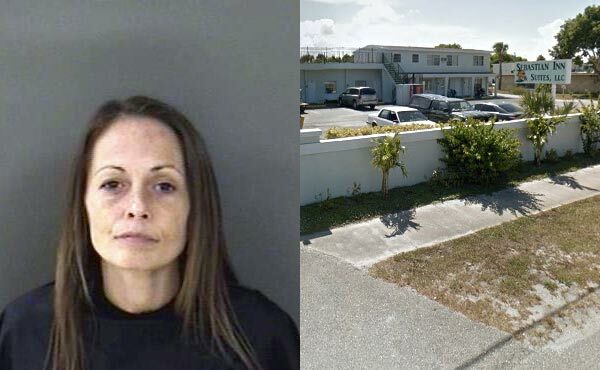 Indian River County Sheriff’s deputies made contact with Whyard and immediately smelled the odor of an alcoholic beverage emitting from her breath. Whyard then began making obscene gestures to the people in the surrounding area. A friend approached Whyard to try to take her home, but she refused. Whyard began cursing obscenities at deputies as a crowd of people gathered to watch. The Sebastian Inn & Suites issued a trespass warning to Whyard. Whyard was arrested for disorderly intoxication. While seated in the patrol car, she yelled obscenities all the way to the Indian River County Jail.